Well, we are coming to the end of August. For me, this brings to mind the idea of change. The summer season is coming to an end and lots of changes will be taking place. Days at the beach change to back to school days. The slower pace of summer changes into a frantic pace to get all the items needed for back to school. The changes are not good or bad -- they just are. For each of us, serious change come with a change of heart, a change in how we feel about things and a change in the way we see ourselves and our life. Although change can be difficult, it can lead us to healthier lifestyles and other positive experiences. I am sure you know that a standing pool of water is not as refreshing as a rushing brook. Standing still can cause us to become stale and to stagnate. To live life to the fullest, we need to accept life’s changes and look for the blessings within each change. Jesus was a perfect example of someone who was an agent of change. While the changes were for the good, the journey was not an easy one. We are all asked to help to make this world a better place. We need to discover and nurture our inner source of strength, knowing that we hold deep within ourselves a great source of courage. As we change schedules and move on, perhaps, to new positions, ministries or situations, let’s pray to be able to accept the changes that come into our lives and continue to grow in gratitude for all our blessings. Sometimes change comes as a surprise and that can bring with it a whole new set of challenges, but we must remember that God is always with us. For students entering new grades, for parents sending their children to their first days of kindergarten, junior high, high school and college, and for all of us who may be entering new situations, know God is forever with you. May this week bring life through the changes you experience along the way. God bless! Photo: Back to school (2017). 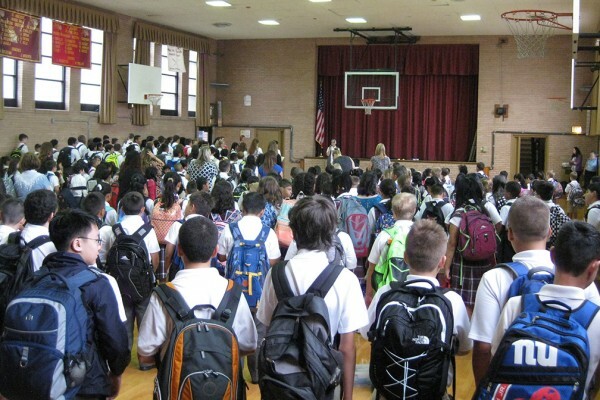 St. Adalbert Catholic Academy in Elmhurst, NY where our new Provincial Superior, Sr. Kathleen Maciej, formerly served as principal.